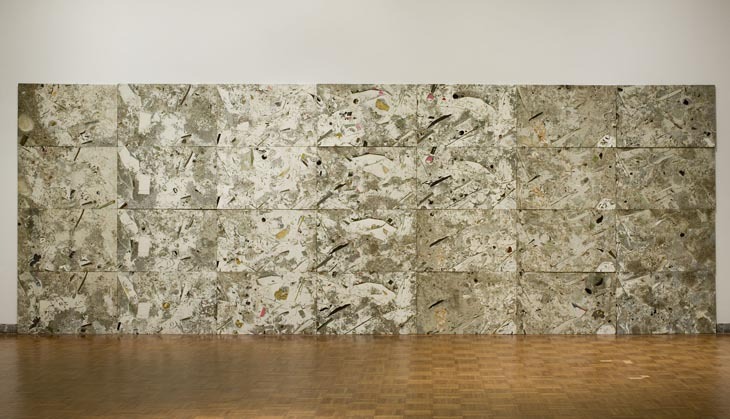 Comprised of 29 individual panels assembled as one large piece, Jedediah Caesar’s Dry Stock is a ‘painting’ that might best be described as a sculpture. To make this work Caesar collected the dirt and other items meant for the trash from carpentry and metal cutting factories and used them as ‘pigments’ and readymade shapes of colour and texture for his abstraction. Sealing these within a large solid block of resin which was then sliced into thin segments, the tiny objects suspended in the work’s surface give the effect of giant microscopic slides. Presented in chronological order, the tableau reads from top to bottom like a film strip, scrutinizing the dissected progression of objects in space. Through recycling the inevitable waste of production, Caesar approaches making as a form of hyper-efficiency, transforming excess and offscourings into an infinitely detailed and beautiful abstraction.